Arthur Frederick Hughes was born in Gloucester in 1866, the son of a dock labourer. Starting life in Wooton St Mary, Gloucester, he lived in Longford as a teenager. Arthur was a goal-kicking full-back, who distinguished himself with his boot in the Second XV during the 1886-87 season. His first appearance in a First XV match was on 10th February 1887, but he played for the opposition, Willesden, who had presumably travelled down from London a player short. The following week he was back in the Gloucester 2nd XV against Cardiff 2nds. His career then took another unusual twist when he played for Gloucestershire against Somerset at the Spa on 22nd February 1887, not having been named in the team the day before the match, and thus winning his first County cap before he had played for his Club first team. He seems to have been brought in at the last minute in order to do the goal kicking, although his various attempts were unsuccessful. 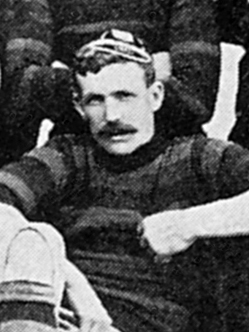 He did indeed gain a permanent place for Gloucester the following season, 1887-88, when he made 18 appearances, but he was not first-choice kicker. He also won further County honours against Somerset and Devon. In 1888-89, Arthur made 19 appearances for the Club and kicked six conversions, although he was “generally delegated the shots from long and most difficult angles”, which doubtless accounted for him succeeding with six kicks and failing with 13. He played for Gloucestershire against Somerset, remained in the side against the New Zealand Maoris at the Spa on 2nd February 1889, the first international side to tour the UK, and also played for the County against Oxford University at Kensington. During that summer, Arthur married Kate Wakeman, and his profession was given on the marriage certificate as “Cricket Professor” – he was employed by Oxford University as a professional cricketer. In 1890-91, Arthur was again the Club’s most successful kicker, with 15 conversions from his 24 appearances, although it was noted that he “has fallen off in kicking after starting remarkably well”. He also scored the only try of his Gloucester career (although he had scored three for the Second XV in 1886-87). On his day he was still judged to be one of the best full-backs in the South of England, and was selected for an England trial on 5th November 1890 at Blackheath, playing for the Western Counties team, which lost 1-9 to London and the Midlands. He won four more caps for Gloucestershire, including an appearance in the County Championship semi-final against Lancashire at Manchester on 14th March 1891, which was lost 0-14. However, on the season as a whole, the Citizen reported that “we cannot say that he has maintained his form altogether this season. He has been sometimes unreliable, having played in very indifferent fashion in some matches, but has retained his place in the team by playing very finely on other occasions.” Part of the problem was acknowledged to be that he suffered indifferent health at times. He was back playing for Gloucester in 1892-93, made another 23 appearances, and played in all three Gloucestershire matches. Arthur retired early in the 1893-94 season, but when his replacement dropped out, he was persuaded to resume, and played another 23 matches for Gloucester. He also turned out for the County in their first match of the season. He played for neither Club nor County in 1894-95, but returned in 1895-96, making 22 appearances for Gloucester and one for the County. By coincidence both his final appearances were made at Weston-super-Mare. His final County appearance was a 3-23 loss there to Somerset, and his final Club appearance was on 14th March 1896, an 8-3 victory over Weston. He finished with 186 appearances, one try, 47 conversions, one penalty, and one dropped goal for Gloucester, 23 appearances and two conversions for Gloucestershire, and two England trials. His playing days were not over – he went on to play for Burton-upon-Trent, against whom he had played in the first match at Kingsholm.